But what if I have a book like Matt Ridley’s excellent Rational Optimist sitting in my Amazon shopping cart? This is a book I’ll definitely want to shelve, refer to and loan out. If I’ve got a two hour drive tomorrow and a cross country flight the next day, I’m confronted with a lousy choice. It seems wasteful to pay full price for the same book three times over. Yet I’d be happy to pay something more to have e-book portability, print book longevity and audiobook convenience. This is a perfect opportunity for Amazon to up sell me. There are upsides for Amazon beyond more revenue. Since I have the electronic copy available immediately as a download, I don’t care if they save money by shipping the printed copy to me slow-boat, instead of second-day. Since I’ll have the printed copy for long-term reference I don’t care if they restrict the digital copy to not be transferable to other devices. This would also open opportunities to implement cross-platform features further solidifying Amazon’s position, such as the ability to pause the audiobook when I drive up to the hotel and have the e-book open up to the correct page later that night in my hotel room. It just makes so much sense. Let’s take a real scenario. One of the many e-books now sitting in my Amazon “buy it later pile” sells for $12.99. The printed copy costs $13.02 delivered second-day (yes, I know, it makes no sense – e-books are overpriced). The audiobook download costs roughly $15, depending on which plan you have. That’s a total of $41. If Amazon offered to bundle up two versions of the same $12 book for $20, I’d buy the bundle most of the time – an 80% increase in revenue. If all three versions cost $25, I’d find it hard to resist. Amazon would be turning a $12-$15 sale into a $25 sale by bundling versions of the exact same book. This wouldn’t cannibalize sales because the customer is unlikely to have ever bought the other versions separately. That’s a win for the customer, a win for Amazon and a win for the author. Having such a capability would also enable other revenue generating opportunities such as discounted follow-on sales. There are some books that I’ve bought in one form but after having them realize I wish I’d bought them in another form. 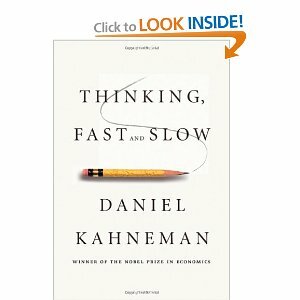 A good example is Daniel Kahneman’s excellent Thinking, Fast and Slow. I bought this as an audiobook but stopped listening to it a little more than half way through. It’s a great book but it’s got some pretty deep, densely packed scientific concepts. After listening, I realized I should have bought the print version to fully absorb the material. Interestingly, Amazon’s Audible app on my phone knows that I listened to nearly six hours of this book quite avidly and then stopped. Yet it’s still sitting there in my playlist. If Amazon were to hit me with an offer to buy either the e-book or the printed book for a deal, they’d likely have a sale. The frustrating thing is that I’ll bet there are folks at Amazon who know all this, agree completely and would love to start pleasing customers and earning more revenue this way. But they can’t and I can guess the reason why. The people responsible for publishing the printed book, the e-book and the audiobook are from different divisions in the publishing company. Their bonus depends on the revenue and profitability that their version of the book generates. The fact that the publisher and author stand to net more revenue overall from bundling doesn’t matter to them. Even if gross revenue is higher for each division, apportioning the revenue between divisions means that someone will gain and someone will lose profit margin. Fundamentally, the issue is that content publishers have double vision. Sometimes they want to view the content they publish as a license to consume, such as when they would like to prevent you from loaning or reselling the content you bought. Other times they want to view the content they publish as merely selling the media the content is on, such as when you would like access to the content on different devices or, back in the day, when your CD got scratched. Trying to recast their relationship with content consumers in this way might be beneficial in the short-term but I think it reduces the publisher’s long-term revenue potential. Content publishers generally perform a worthy function as long as they aggregate valuable content, serve consumers and maximize income for authors. When they stop doing that effectively, I think it opens an opportunity for Amazon. Amazon already publishes books themselves either in e-book form or through their low-volume, on-demand printing division. The problem is that the vast majority of these indie titles aren’t available as audiobooks or as high-volume, lower-cost printed books. That’s where the cross-media up sell opportunity is waiting.